Warren Lee Benjamin, 20, of Pine Mews, Liverpool, Tyreece Reid, 18, of Botanic Road, Liverpool, and Jordan Morris, 32, of Boswell Street, Liverpool, have all been charged with attempted robbery at Tesco Express in Forton Road on Monday. Hampshire police said a female security officer was threatened at knife-point during the cash in transit robbery. Benjamin has also been charged with possession of a knife in a public place. 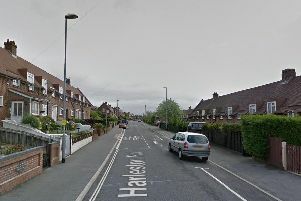 A police spokesman said: ‘We were called at 12.54pm on Monday, April 15 after a 54 year-old female security officer was threatened with a knife and pushed to the floor outside Tesco Express in Forton Road. All three have been remanded to appear at Portsmouth Magistrates’ Court this morning.